The Canlan Ice Sports eastern flagship facility at York University in Toronto was managed by a 20-year old ice rink chiller system whose operating cost was higher than optimal. This facility has six ice rinks and is used year round. Keeping that much ice cooled requires a constant flow of energy. A more energy efficient solution was required in order to keep Canlan Ice Sports’ costs low. The facility is widely used and successful, however electricity costs were cutting into their revenue. 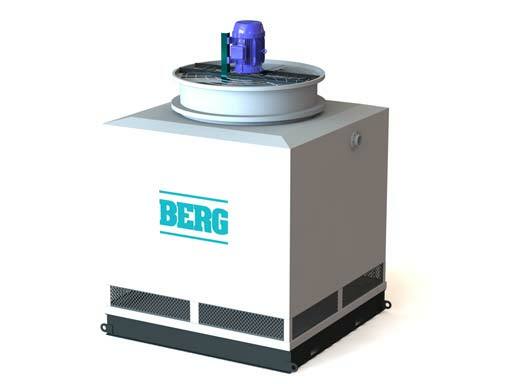 They turned to Berg Chilling Systems and their recently acquired refrigeration specialist, Industrial Refrigerated Systems Ltd. (IRSL) for a solution. The facility was running on a system installed in the 1990’s, and although at the time it was chosen for its low-cost design, it was lacking the sophisticated control technology currently available. The secondary refrigeration loop in the system was too tightly specified, which required an additional compressor in the primary loop in order to compensate. This combination maintained the ice temperature but at too high of an operating cost. Removing the bottleneck in the secondary loop would decrease the energy consumption and required cooling capacity of the primary loop. The end goal for the project team was to realize significant energy reduction in all aspects of the multi-component system. To begin, the project team examined the equipment the arena used, the piping, rink operations and temperature requirements. They confirmed the secondary refrigeration loop was unable to provide enough coolant flow to cool the ice. Increasing the coolant flow would mean that the three 250 horsepower screw compressors that the arena used could be switched out in favour of three 125 horsepower reciprocating compressors. The new reciprocating compressors would perform similarly or better than the screw compressors, but would consume half the energy. 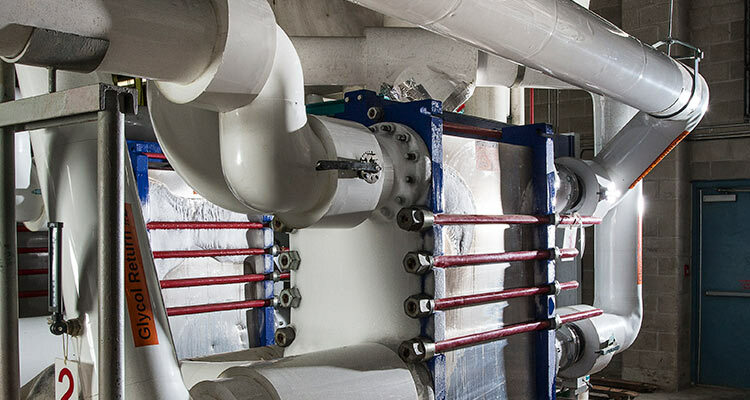 Additional upgraded components in the system included an increase in the size of the plate and frame chillers, which allowed the project team to maximize the system’s ability to remove heat from the arena. Additionally, the original mechanical room used a single glycol header which then split into three lines, with each line feeding a pair of ice rinks. The warm glycol then returned via a common header leading to the chillers. This combination of lines, and shortage of isolation valves meant that an issue with one ice rink affected all six circuits. With no way to quickly isolate which ice rink was being effected by the issue, each one needed to be inspected. This inefficiency consumed more time than was necessary and impacted arena operations. The glycol pumps original on/off mode didn’t allow for fine tuning, and so the project team installed variable frequency drives that would each feed a specific rink. This meant they could work to match demand without extraneous energy usage, and allowed the arena system management team maximum control and efficiency. One of the key requirements for a project involving recreational ice refrigeration is to find a solution that can be acted upon without an extended shutdown of the arena operation. This is vital to avoid revenue loss because the facility won’t lose just the shutdown time, they would lose the commitment of sports teams for an entire season’s worth of play and practice time. The majority of the system investigation and design was completed in late April of 2017, followed by re-piping and a multi-stage switchover of individual ice rinks. The project team then removed the older screw compressors, and installed the new reciprocating compressors. The plate and frame chiller and pump installation followed shortly afterward. This allowed the updated system to get up and fully running by January 2018. After the start-up of the new system, the project team completed their calibration and testing in order to further reduce energy costs. This fine tuning of the system created a more consistent temperature control, and an optimized coolant flow. The last step was implementation of an innovative liquid leg equalization header, which brought the project to a completion date of May 2018. The combination of upgrades helped Canlan to reduce their peak energy demand by 45%, from 1,000 kW to an average use of 550 kW. This dramatic energy usage cutback, if implemented in other large commercial facilities, could see positive reduction in grid load demand. A major incentive for business owners is the monetary result seen in their reduced energy costs. Running a successful business only works if your service is affordable for your clients. 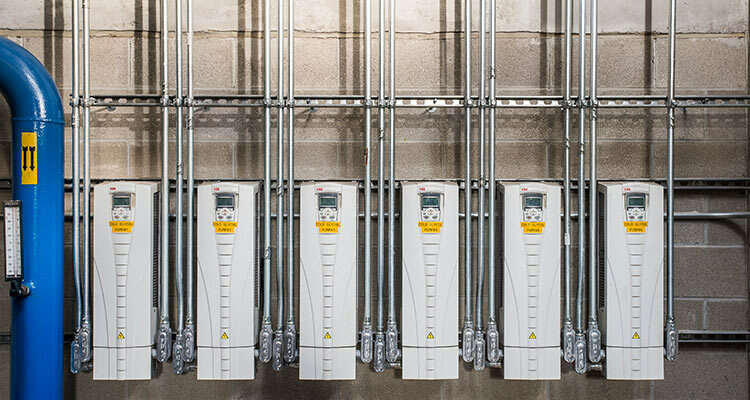 Canlan’s power distribution company, Toronto Hydro, recognized the potential energy savings and lessening of grid load. Through Ontario’s Save on Energy program, they agreed to $135,000 of incentive funding. The York University facility is now undergoing a validation process to confirm their new energy efficiency and to decide their final eligibility for the funding. The Berg and IRSL team worked closely with Canlan and other highly regarded engineering and technology organizations to problem solve, design, and create a new system for the York University arena. Their end goal was to reduce energy costs, and they were able to realize energy usage reduction of 45%, which will save more than $300,000 annually.The collaborative redesign of the system architecture is only one example of Berg and IRSL’s engineering innovation. For over 45 years, Berg has delivered industrial process temperature control solutions for the recreational sports sector.